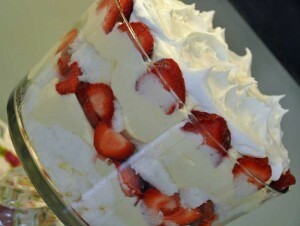 If you can find fresh strawberries in your area, I highly recommend making this trifle! This trifle recipe is perfect for tea parties, birthday parties, or bridal/baby showers. It’s such a pretty dish. Garnish Redi Whip and more strawberries. Whip the pudding, milk, and whipping cream in a bowl until thickened. Spread a layer of the pudding mixture around the perimeter at the bottom of the trifle dish. Place a layer of cake at the bottom. Layer the strawberries around the bottom (on top of the cream mixture and on top of the cake. Spread another layer of the cream, cake , strawberries and repeat until you reach the top. Spread the whipped cream over the top and garnish with strawberries.